People's Kitchen Collective is leading social and political education projects that encourage Oaklanders to be more mindful about what they eat. "We come together around ingredients and really thinking about how we can decolonize food," said co-founder Sita Kuratomi Bhaumik. "To think of the exchange of hands and how much labor goes into the food that goes into our plates." Co-founded by activists Kuratomi Bhaumik, Jocelyn Jackson and Saqib Keval, People's Kitchen Collective takes social and political inspiration from the free breakfast program of the Black Panther Party. Since its founding, the group has fed hundreds at free breakfasts held at DeFremery Park as part of Life is Living. The organization bills its events as a series of meals with artists, poets, researchers and activists. A current meal series is examining the farm-to-table supply chain, culminating in a free, sit-down dinner on May 20 along three blocks of Magnolia Street in West Oakland. In addition to the meal, there will also be presentations by neighborhood artists, residents, and organizations. People's Kitchen Collective welcomes further input from residents interested in getting involved. "We really want to narrate history through the food that people experience," said Kuratomi Bhaumik, "and we want to specifically ask folks to contribute their experiences of Magnolia Street, to share stories of Oakland and gentrification." 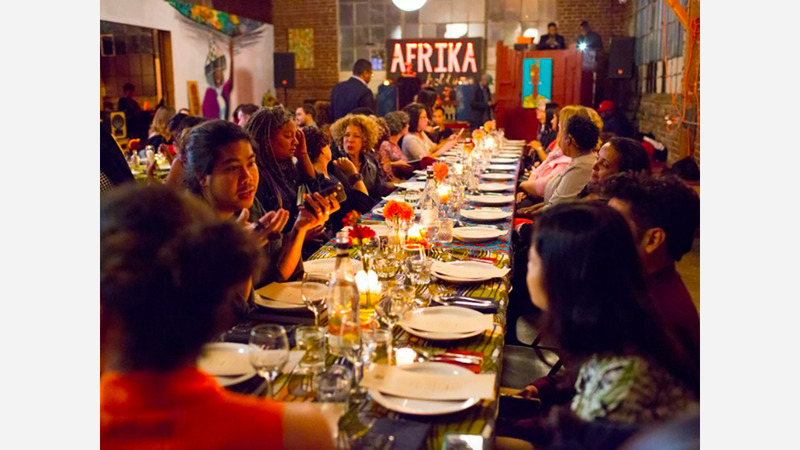 "Our hope is to think about all the ways that we have been supported through food--in terms of our elders and communities and all the traditions that exist around food in Oakland--and how we can reconnect through that," said Kuratomi Bhaumik. "Oakland has an incredible legacy of eating out loud."